Go to Chiang Mai. Check into River View Lodge. Stay three days. Go home. Perfect. Oh, you’d like a little more detail? Day One: Woke to sunshine! 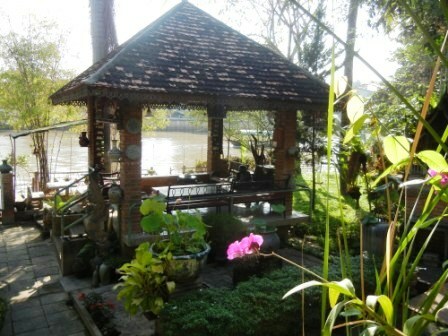 Out our window – a lovely patio garden, and a river view. Breakfast on the patio looking out over the river, with real French-style croissants (not just crescent-shaped bread). Then out to see Chiang Mai armed with our Lonely Planet guides. Temples – shops – stupas – temples – shops – stupas – shops – temples – shops. DM has gone mad, bitten by the bargaining bug. As a result, what should have been an hour-long stroll to the central temple took three hours. We break for lunch at a bustling Thai restaurant packed with people and wonderful smells. 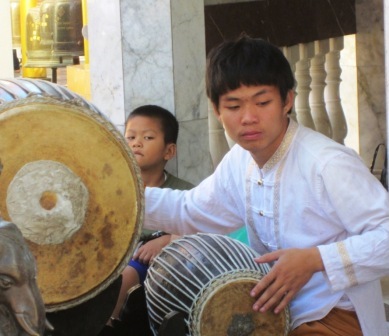 Afterward, it is getting hotter – more shops and temples. Too late for massage – we return to hotel and settle for a COLD swimming pool. After this refreshment we walked a couple of blocks to the Night Market for dinner and a folk dance/folk music performance – and more shopping. Day Two: Shower (After 12 days trekking, I can’t get too much hot water! 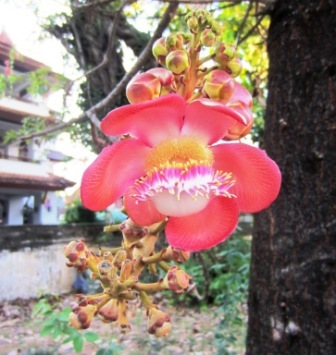 ), laundry, breakfast (those croissants again) , and a little catch-up email at the free Internet computer under the banana trees, we walk to the Street of Silk – shop after shop of beautiful glistening fabrics that made my fingers itch to touch, stroke, fold. Then we took a Tuk tuk (Motorscooter-style taxi) to the Women’s Correctional Institute for afoot massage and lunch. Feet feel great! 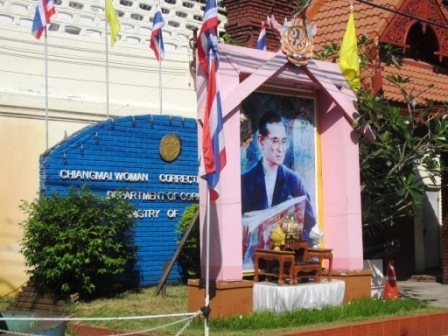 Outside the prison building, as was true with many other public buildings, was a shrine dedicated to the much revered, ailing King of Thailand. It was odd and touching to us Americans to see how deeply the King is loved, without a trace of the irony which us Westerners bring to our political figures. DM consulted with the concierge at the Lodge and found an afternoon cooking class for us at Asia Scenic Thai Cooking School. 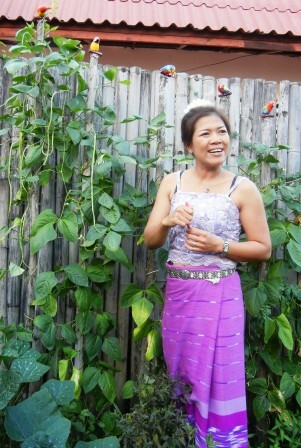 After an afternoon sight-seeing, we were picked up by “Mum:” the loud, brash, funny chef-in-charge. We added 5 Italians, 2 Dutch, and 3 Germans to the van, and off to Mum’s garden/house/outdoor cooking school. First an explanation of what is grown fresh in the garden (basil, mint, bean sprouts, lemongrass as expected; a peat wall unexpectedly sprouting mushrooms). Then to the nearby open air market for fresh fish, meat, additional spices, additional vegetables. The class was mostly conducted in English, the byplay between students mostly in German. DM, a fluent German speaker, did some translating. We pounded, pestled, chopped, ground, stirred, with Mum barking out commands like a drill sergeant. And we did cook good food: soup, pad thai, and curry. Happily back to our jungly hotel. We took a taxi to Wat Doi Sethup on the top of the hill, barreling past the lovely campus of Chiang Mai University and the entrance to the Chiang Mai Zoo (pandas there! Shoulda stopped!) The Wat is yet another extravanganza of golden buddhas, golden tile, folk-singing and dancing children from various schools asking for donations. We walked around to the back to see the view of Chiang Mai spread out below, took a path partly down the mountain just to get away from the bell-ringing, chanting, and general cacophony that seems to accompany Thai worship. The peaceful tropical hillside of monks watering their garden, cats peeking out from the leafy undergrowth, seemed part of another world. Feeling a bit burnt out, we settled for a quiet non-descript lunch at the River View Lodge, then walked across the Iron Bridge (pedestrians only) to a neighborhood massage parlor that Mum had recommended to DM. No one here was clutching a copy of the Lonely Planet guide – just dumpy middle-aged Thai folk on their work break, maybe, being pummeled by equally dumpy but very effective masseuse teams. The masseuses were tickled to be working on a pair of silver-haired foreigners – they passed over our unusual scars and focused on our weary backs, legs, and shoulders. Tea at the end – very nice, very quiet. 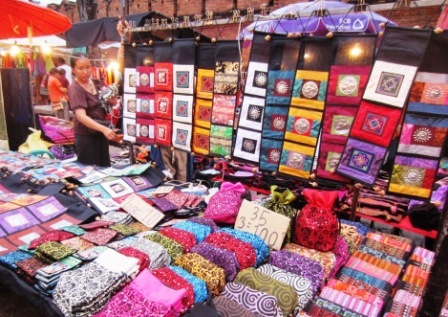 And for contrast that night – the Sunday Street Market. The whole of the main street between the Canal and the temple is given over to street vendors of all sorts – musicians asking for donations, food vendors, book sellers, and the usual wood carvers, weavers, jewelers, gold and silversmiths, etc. Even the Buddhist stupas were selling food, drink, and crafts – no escape! We dropped off to a side plaza to find food at a vegetarian open air restaurant. By the time we finished, the market had become so crowded that it was nearly impossible to move – we had exhausted our gift list just ahead of our gift budgets, and so extricated ourselves and walked back to the hotel for our last peaceful sleep beside the river.